A snack with flavor that simply smacks of autumn, like a sudden chill in the air or the splendor of red and golden leaves adorning a tree. 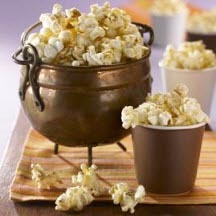 Mix popcorn and nuts in large buttered bowl. Combine sugar, syrup, butter or margarine, water, salt and cinnamon in saucepan. Heat slowly to the boiling point, stirring until sugar melts. Cook to hard crack stage, 290°F to 295°F (145°C). Pour syrup in a fine stream over popcorn and nuts. Stir until popcorn and nuts are evenly coated with syrup. Spread out on large buttered surface or waxed paper. Separate into bite-size portions with forks. Cool.